A.D. Gordon was a Zionist ideologue and was most associated with what was called "practical Zionism." 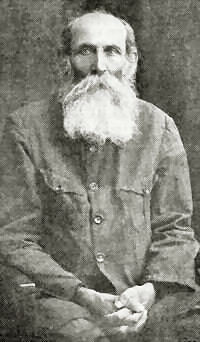 He founded the group Hapoel Hatzair, which means "The Young Worker." To the existentialist Gordon, manual labor was like a religion. Influenced by Leon Tolstoy, he once wrote, "Surely in our day it is possible to live without religion." He shied away from Zionist politics and was anti-Marxist. Aaron David Gordon was the only child of a wealthy, Orthodox family. He taught himself about religion and other subjects and knew how to speak a number of languages. Gordon made Aliyah to the then Ottoman-controlled Palestine in 1904, accompanied by his wife and daughter. Soon after his immigration, his wife died. He lived in Petach Tikvah and Rishon Le Zion, eventually settling in the Galilee in 1919. To sustain himself, he would take work doing agricultural labor. During this time, his philosophies would evolve, and he would take pen to paper and write it down. Gordon believed that the way of salvation of Eretz Israel and the Jewish people was through creative labor and the learning of the Hebrew language. He believed that Jews must learn how to do physical labor; this in turn would unite them as a people, uplift them spiritually, and better connect them to nature. He believed that, in order to accomplish this, Jews must organize into groups and learn how to do physical labor before immigrating to Eretz Israel, where what they would be taught would be put to the test. Gordon once stated that "The Land of Israel is acquired through labor, not through fire and not through blood." The teachings of A.D. Gordon eventually lead to the formation of the Gordonia youth movement. Making practical use of Gordon's existential philosophy, the Gordonia groups established a number of kibbutzim in Israel. For more on the Gordonia youth movement, click here.